A network of hi-tech taps is to be installed across Scotland to encourage people to use refillable water bottles. Scottish Water says its "top-up taps" will be fitted in about 30 towns and cities over the next two years. The first water refill point will be located outside the Scottish Parliament in Edinburgh during October. Other taps could be fitted in Glasgow, Ayr, Dumfries, Dunfermline, Fort William Milngavie, Oban, Inverness and Aberdeen by the end of March. It is part of a drive to persuade more people to carry refillable bottles and cut down on single-use plastic. The Scottish government said it was committed to piloting a network of public refill points in its latest programme for government. And earlier this year Network Rail announced plans to offer drinking fountains at Glasgow Central and Edinburgh Waverley. A study by Recoup, a charity promoting plastics recycling, found that UK households use nearly 480 plastic bottles a year but they recycle just over 280 of them. 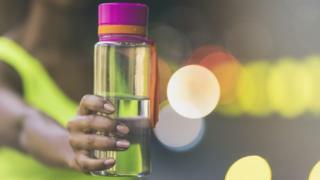 Scottish Environment Secretary Roseanna Cunningham said the new scheme would help cut down on single use plastic and promote the benefits of drinking water. "I now look forward to refilling my bottle at the 'top-up tap' outside the parliament in the coming months," she said.